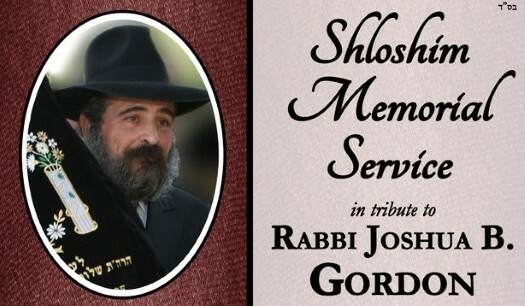 Many hundreds are anticipated to attend the Shloshim Memorial Event paying tribute to the life and legacy of Rabbi Yehoshua B. Gordon, of blessed memory. The Shloshim will take place tonight at 7:00pm PST (10:00pm in New York), at the headquarters of Chabad of the Valley in Tarzana, CA, and thousands more will join online via live stream, which can be watched here on CrownHeights.info, courtesy of Chabad.org. Friends, family members and dignitaries will be sharing memories and reflections. 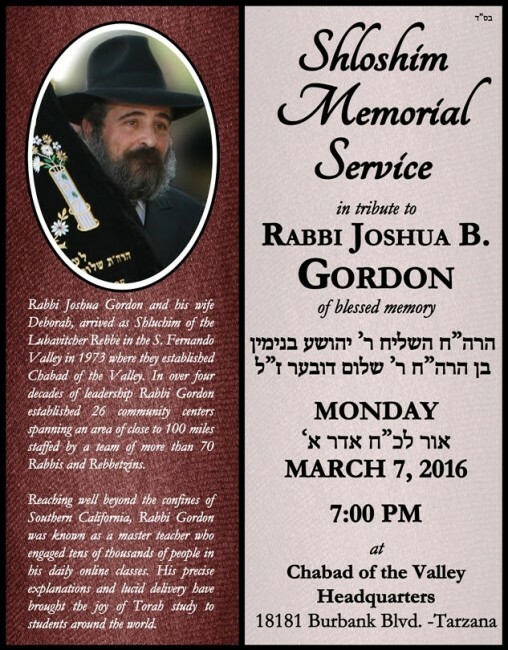 The organizers have also announced the creation of the “Rabbi Joshua B. Gordon Living Legacy Fund,” dedicated to perpetuating and expanding Rabbi Gordon’s lifelong work through his organization, Chabad of the Valley, bringing Judaism to life and teaching Torah to the world. Following the Shloshim, an initial 24 hour Charidy Campaign drive with the aim of raising more than $1,000,000 to launch the fund will commence on Tuesday March 8th. Over the past month, since Rabbi Gordon’s tragic passing, more and more people have come forth with stories and memories of his incredible spirit of selflessness and dedication. In his position as Director of Chabad of the Valley, Rabbi Gordon inspired an explosion of Jewish observance and activity in the greater San Fernando Valley, an area with a diverse Jewish population of more than 250,000. From the days of the small house in Encino where Rabbi Gordon began his operations in 1973, twenty-six Chabad Houses now exist under the umbrella of Chabad of the Valley, each of them bursting with Jewish community and energy. Despite presiding over an expanding network of Jewish activity, Rabbi Gordon was most beloved for his remarkable sensitivity to individuals and their unique challenges. 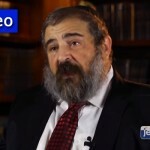 The stories being told are astonishing: from driving over to a sick woman’s home to change the baby’s diaper, to chauffeuring children to Jewish schools in Los Angeles so that they would receive a Jewish education; to quietly disbursing funds from his own operating accounts to everyone from brides in need to organizations in crisis; Rabbi Gordon was man who filled a need when he saw it. 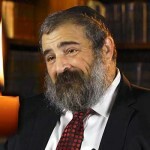 In what turned out to be the last few years of his life, Rabbi Gordon’s reach and impact grew exponentially when Chabad.org, the world’s largest Jewish website, began broadcasting his daily local Torah classes on their site. Over 5,000,000 views later, his classes continue to inspire and warm hearts and minds across the globe. i dont hear a thing.do u??? ?